﻿ As much as The Cruel Knives would want you to think the success of their PledgeMusic campaign to fund this debut EP is a surprise, going back through the band’s lineage will prove it to be anything but. After all, guitarist Sid Glover and bassist Rob Ellershaw both cutting their teeth in Heaven’s Basement and enjoying a fair few rewards to boot, particularly with 2013’s Filthy Empire. The Cruel Knives can be seen as more of a continuation then, embracing a similar type of straightforward hard rock with a modernity that never feels intrusive or distracting from the actual music. And even though Side One needs some serious fleshing out in its ideas to reach those same lofty heights as Heaven’s Basement, it’s a mouth-watering taster of what’s to come, especially in the fact that very little firepower has been lost in the interim. The titanic grooves of The World We Were Sold and The Promised Land‘s thunderous, purposeful stomp are enough to vouch for that, and even if Tom Harris’ vocals can come across as a bit thin for this sort of material, there’s latent power still there and the sort of wail that could come in handy for my expansive, classic metal-leaning efforts in the future. Because that’s what The Cruel Knives come across as at the minute – an embryonic entity that have a lot of growing to do before they hit the big leagues. But even if that’s the case, Side One‘s command of hard rock’s most populist sensibilities alongside some conventional though not totally unmanageable lyrical themes make it familiar but still engaging. The instrumentation is where this shines the most, with enough guitar and bass crunch, particularly in the big, bluesy crawl of Squeeze, to remain grounded in that rock-solid foundation while still keeping those skycraping hooks that are easy to latch onto. The only reason that Kill The Messenger is the weakest track here is that it doesn’t stick as well as the others; otherwise, the progressive touches in the guitar work throw some much-appreciated complexity into the mix, and some increased heft makes for a decent mid-EP peak. But really, Side One comes across as an easy EP to make and an even easier one to like. It’s well within the confines of its own genre, but even at this early stage, The Cruel Knives have settled on a formula with a lot of stock in it, even if it isn’t too far removed from what they’ve already mastered. Regardless, this is already as good of a preview as you’re likely to get, showing each skill in sufficient detail while remaining concise and consistent. They’ve already hit the ground running, but there’s still a lot to come from here. 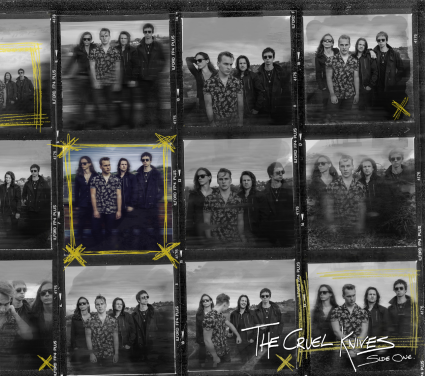 ‘Side One’ by The Cruel Knives is released on 28th July.